Beautiful 3 Br House! Enjoy the Peace and Quiet. One short block to the beach! Awesome location. Our beautiful 3BD house is on a large, quiet lot with an extremely short walk to the beach, just one short block. You can hear the waves from front porch! The Restaurants & Shops on Center St are a ½ mile walk along a neighborhood street. There’s also a nearby playground for the kids to play. From the front porch you’ll hear the waves; from the back porches you’ll hear the wind in the palms and natures sounds of the low country. The entire house has been newly furnished from top to bottom, including kitchen items, luxury towels and bed linens. 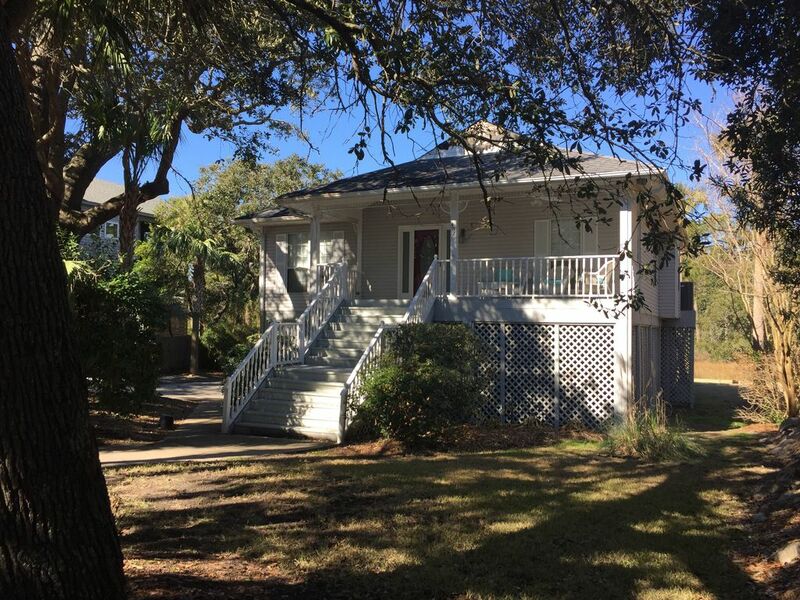 The house has traditional South Carolina charm with fans on the large front porch and screened porch in the back, perfect for dining and lounging... with another porch for sunning... plus a rooftop “Captains Deck” for looking above tree line and watching the sunset. After your beach adventures, it's a quick easy walk back to the house where there’s a convenient outdoor shower located at the back of the house to rinse off. Inside the house, the interior is light and bright with skylights, wood floor, and lots of windows in the dining area with a view of a large backyard. With three bedrooms and two bathrooms , there is plenty of room for everyone. Park your car(s) under covered parking - you won’t need when it when you’re exploring Folly Beach. If you have any questions or needs, the husband and wife team managing this property are nearby and happy to help. We're just one short block to the beach access! There's plenty of private parking including with two covered spots plus room for 2 more cars. Kevin has a handsome and nicely restored house on Folly Beach. It is absolutely quiet and we were very happy here. He was very responsive at each step of the way, from local eats and a superb local fish market, we thrived. We spent most of our time in Charleston, as the weather was rainy and cool theses last few days. This is a must see place and Kevin is a super host. The house was wonderful, just a one block walk to the beach and close to Folly Road. Kitchen was well equipped. The owner made the late check in very easy and he provided a wealth of information on the area. It was my first time staying at Folly Beach, but it will not my my last. The house was comfortable for all 6 of my family members. Close to the beach, neighborhood playground, and a nice shaded walk to down to the shops and restaurants on center street. We enjoyed the yard with hammock in the front and searching for crabs in he marshy area in the back. We loved staying at Kevin’s property. He was extremely accommodating. The house was well maintained and stocked with everything we needed for a weekend trip. The rooftop deck, front porch, and hammock were great places to relax. We could easily cook in the kitchen. Short walk to the beach, and chairs came with the house. It’s even a convenient walk to downtown Folly for restaurants and shopping. We will definitely be back! Great place very close to the beach. The house is a very short walk to the beach, which is nice. The house itself worked out great for me and I highly recommend it. This was an amazing find. Well equipped and maintained, private space. The house is very close to the beach (steps), and walking distance to the town for entertainment, food, and shopping. Also, only a quick easy drive to all of the History that Charleston has to offer.